Does the HTC One M8 have better battery life with Windows Phone? 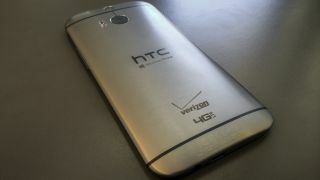 Update: A spokesperson for Verizon has confirmed with TechRadar that the battery specs listed on the carrier's official HTC One (M8) product page are correct. In other words, yes, the Windows Phone 8 version of the HTC flagship has superior battery life to the Android version. It was made official Tuesday: HTC is releasing a new version of its flagship HTC One M8 running Windows Phone instead of Android. That news had been rumored for a long time, but the bigger scoop is the HTC One M8 for Windows Phone reportedly has better battery life than its Android predecessor. This wouldn't necessarily be so unusual if not for the fact that the two versions of the HTC One M8 have utterly identical hardware. It's a pretty good indication that Windows Phone 8.1 inherently drains less battery power than current versions of Android. The HTC One M8's 2,600mAh battery is said to last for 22 hours of talk time and 528 hours in standby when running Windows Phone, whereas the older Android version with otherwise identical specs gets 20 and 496 hours, respectively. These numbers come straight from HTC's official specifications for the two devices. The lengths cited by Verizon - the HTC One M8 for Windows Phone's sole carrier at the moment - show an even more drastic difference; just 12 hours of usage time and 12.2 days on standby for the Android version, and 21 hours and 15.5 days for the Windows flavor. It appears Verizon and HTC used different criteria to evaluate the phones' batteries, which helps explain the discrepancy between the lengths the carrier and the phone maker claim. But regardless, they agree that the Windows Phone version has the superior battery life. We asked both HTC and Verizon about these numbers, and spokespeople for both companies said they're looking into them. We'll update here if they provide anything worthwhile. Will the iPhone 6 be announced next?